Pregnancy is exciting and terrifying, but it may also be financially troubling. Having a baby can set you back thousands of dollars in the first year alone. 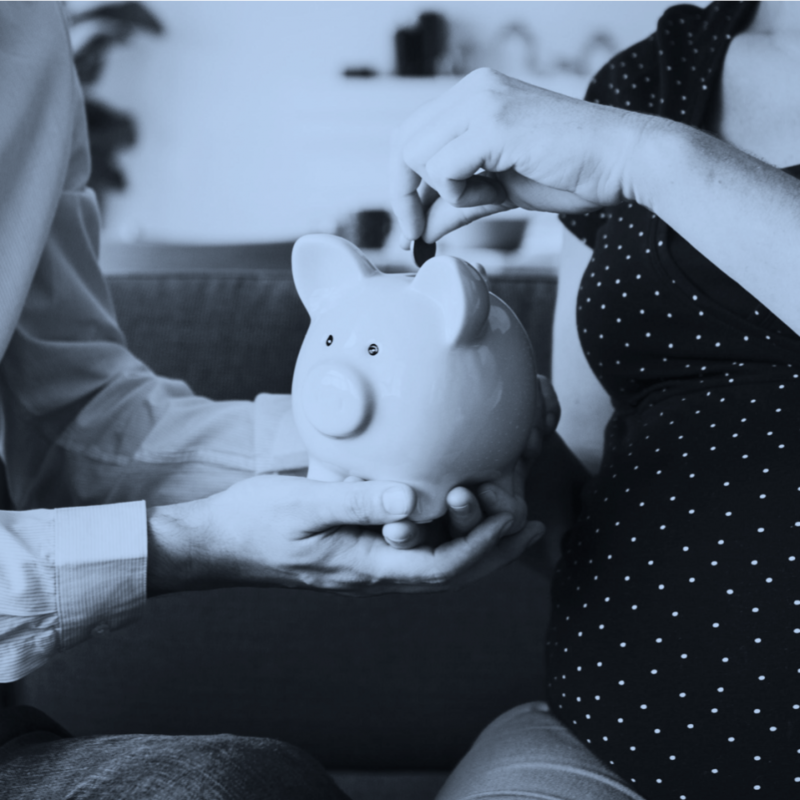 Making sure you’re prepared to handle the expenses that come with pregnancy, labor, and baby care can be somewhat overwhelming. Fortunately, pregnancy is the perfect time to learn how to budget, cut costs on necessities, and put money aside for emergencies. Before buying anything, write up a budget. You can use this cost calculator from BabyCenter to determine how much you should expect to spend during your newborn’s first year. Creating a budget will help you cut the costs of supplies you don’t need, such as a fancy changing table or tiny newborn clothing. Remember to leave room in your budget to contribute to a savings account — this money will tide you over while off work. Also, create a separate budget for your regular monthly expenses to determine what you can afford while you’re on maternity/paternity leave. Maternity clothes are expensive. If the idea of spending hundreds of dollars on temporary-use clothes sounds like a waste of money, consider secondhand clothing or shop for new items online. You’ll find the best deals on maternity wear from large retail stores like Macys. Plus, if you shop online, you’re likely to find a Macys coupon code to stretch your dollars a little bit further. The same goes for your post-pregnancy clothes. For that phase when your body hasn’t quite returned to its original shape, you may need to find a few items that are stretchier and more comfortable than your usual clothes. Maternity bras and nursing bras, in particular, are essential for providing sturdy support easy breastfeeding access. You can easily find a selection of affordable, quality nursing bras online, and oftentimes discounts are available when you buy several at once. When it’s time to buy baby supplies, start by looking at secondhand options. Check out consignment shops and ask your friends and family members for hand-me-downs. This is a great way to save money on baby clothes, toys, cloth diapers, and a high chair. However, avoid used items that may pose a safety or sanitary risk, such as crib mattresses. Safety standards for cribs, car seats, strollers, and infant carries change frequently, so plan to buy brand new models. Why spend money on things when you can get them for free? Regardless of whether a friend throws you a baby shower, go ahead and set up a baby gift registry. That way, your friends and family can browse through a list of items you want instead of guessing at what you might need. Just be sure to ask for practical items you will actually use. Check out this baby registry breakdown from Today’s Parent if you need help choosing a store. While supplies for baby and mom can be pricey, your hospital bills might take the cake for the greatest pregnancy expense. Start by reviewing your insurance coverage. Determine which procedures are covered from pregnancy to birth and beyond, and find out whether you’ll have to pay copays or deductibles for these medical services. It’s also smart to shop around for a hospital since birth and cesarean rates vary widely among local hospitals. Fortunately, hospitals are now required to post their price lists, so you’ll have an easier time finding one that fits your budget. Just be sure to confirm with your OB/GYN that she has privileges at the hospital(s) your considering. One final piece of prep work you can do to save money — and stress — is to stock your freezer with pre-cooked meals. This will keep you from buying takeout when you’re too busy with your newborn. While it may mean a lot of work right now, these meals will be a blessing down the road. These recipes from The Family Freezer are an excellent place to start. Saving money from pregnancy to delivery and beyond will be a huge stress-reliever for you and your partner. You shouldn’t have to worry about paying the bills or affording diapers when there’s an exciting bundle of joy in your life. Banish financial stress by being prepared. Start budgeting and cutting costs today! Thank you, Emily Graham, of Mighty Moms for writing and sharing your guest post with us!